This was a SAP user group webinar from yesterday. Interesting developments are planned next year for 1809 in terms of system conversion; read below. A while back, my friends at Intel were kind enough to give me a NUC. Thanks, Intel! Anyhow it was time to give it a whirl, so I got it out the cupboard and decided to put SAP HANA Express on it. In this series of blogs, I’m going to take you through getting HANA Express running on a NUC and building an application based on a publicly available dataset. The same principals will work if you want to install HANA Express on any system. This blog provide you an information on fallback snapshot, a new feature that has been introduced in HANA from HDB 2.0 SP 03 version. This is a long time coming blog from me and below are some of the steps that I used to configure the SAP HANA XS apps (HANA live apps) such as KPI modeler, Analytics foundation apps and so on for which the content is in the HANA DB (In the form of the HANA delivery units we apply for those apps) but the apps are viewed in the FIORI URL. So to make this perfectly work we have below steps such as applying the delivery unit for the app, Web Dispatcher routing configuration, SSO between ECC ABAP and HANA DB and finally replication of ABAP users in HANA DB. Though these configurations are used less now a day, due to the introduction of S4 and its own FIORI apps but the different steps and configuration explained here can be used in different use cases. This tutorial will help you creating in a servlet and deploy it to SAP Cloud Platform with a Cloud Foundry instance using Eclipse. The Eclipse landscape has been updated since the aforementioned blog was written and some of the prerequisites have changed for Eclipse. Additionally, this tutorial will connect the sample application to a HANA database schema on SAP Cloud Platform. The tutorial uses JNDI and traditional SQL which is a common means to access the database. This blog is intended to share my experiences on Geo-Spatial Functions implementation in SAP HANA. One of the implementation is implementing Information view to calculate distance between Cities Using Geo-Spatial Functions which I am sharing today. Background: Geo- Spatial function used geospatial data which stored in a geographic information system (GIS). The geospatial data needs to be combined with data from the internet and sensor data, data from business partner to implement point to point implementation, to manage coordinates of different stores, warehouse, utilities of an organization, business for real-time analysis, reporting, forecasting, threat detection. The saphanacentral.com has the sole discretion to provide the terms of payment. Unless otherwise agreed, payment must be received by saphanacentral.com prior to the acceptance of an order. Unless credit term has been agreed upon, payment for the products shall be made by credit card. Invoices are due and payable within the time period noted on your invoice, measured from the date of the invoice. saphanacentral.com has the discretion to cancel or deny orders. The saphanacentral.com is not responsible for pricing, typographical, or other errors in any offer by saphanacentral.com and reserves the right to cancel any orders arising from such errors. Satisfactory payment must be received prior to goods being shipped. Our online payment processor, they collect your information at checkout to process your purchase. Upon checkout, there is also an optional check-box to allow us to contact you for marketing purposes. This is opt-in and is compliant with GDPR. If you would like your purchase history deleted please contact us. The saphanacentral.com does not have to provide a refund if you have changed your mind about a particular purchase, so please choose carefully. We promise our premium users for 100% Money Back Guarantee if the premium user fails to understand or not satisfied with our digital training service. No human interactions mandatory after purchase. We are liable to support/help to provide the digital training material in video formate after successful payment. User required to provide the following details within 30 days of purchase if they are not satisfied with our service who claim for refund. Reference link or screenshot of authorized/trusted books/source which is biased to your reason of non-satisfaction. We do not warrant those product descriptions or other contents of this site are accurate, complete, reliable, current, or error-free. If a product offered on our website is not as described, your sole remedy is to return it in unused condition. You hereby acknowledge that all rights, titles, and interests, including but not limited to rights covered by the Intellectual Property Rights, belong to the site and that you will not acquire any right, title, or interest in or to the Program except as expressly set forth in this Agreement. You will not modify, adapt, translate, prepare derivative works from, decompile, reverse engineer, disassemble or otherwise attempt to derive source code from any of our services, software, or documentation, or create or attempt to create a substitute or similar service or product through use of, or access to, the Program or proprietary information related thereto. We make no express or implied warranties or representations with respect to the Program or any products sold and offered on our website (including, without limitation, warranties of fitness, merchantability, non-infringement, or any implied warranties arising out of a course of performance, dealing, or trade usage). In addition, we make no representation that the operation of our site will be uninterrupted or error-free, and we will not be liable for the consequences of any interruptions or errors. This site and its information, contents, materials, products, and services are provided on an “as is” and “as available” basis. You understand and agree that your use of this site is at your own risk. You agree not to disclose information you obtain from us and or from our clients, advertisers, and suppliers. All information submitted to by an end-user customer pursuant to a Program is proprietary information of saphanacentral.com Such customer information is confidential and may not be disclosed. Publisher agrees not to reproduce, disseminate, sell, distribute or commercially exploit any such proprietary information in any manner. This Agreement will remain in full force and effect while you use the website. You may terminate your membership at any time for any reason by contacting us via email or the Contact Us page. We may terminate your membership for any reason at any time. Even after your membership is terminated, certain sections of this Agreement will remain in effect. We may delete the practice exam result history data at any time for registered users and after the expiration of premium membership for premium users. The saphanacentral.com may go down for maintenance purpose or due to any technical issue with/without prior notice. As part of our content moderation system, we may modify or delete any content/part of content submitted by saphanacentral.com users. ◈ The HANA SQL access, the primary HANA access, allows you to query HANA views using the SQL query language. This access is optimized for on-premise solutions. ◈ The HANA MDX access, that offers multi-dimensional concepts to HANA models, allows you to query HANA views as cubes (including HANA hierarchies) through the Multi-Dimensional eXpressions (MDX) query language. HANA SDI is super set of all, if and only if – HANA is the main data target. Now a day’s lot of questions are coming around HANA SDI like HANA SDI is the only future data integration solution for the SAP? Should we use SAP SLT or HANA SDI for data replication now? SAP Data services will be die in future? To answer all these questions let me try explaining what is SDI technology and How it is different from existing data integration tools. Business Partner configuration while doing conversion from ECC to HANA. The major errors we usually get is CVI_MAPPING and CHK_CONT_MAP. Some ABAPers might have already noticed this button “Graphical Explain” in tcode ST05 but do not know how to use it properly. This blog is part of a blog series which shows to build HANA database artefacts using the SAP WebIDE Full-Stack and the new HANA service on Cloud Foundry. In this section, I am going to show how to create a nodejs module and add an OData service within it. This OData service will be used to expose the contents of the table/view modeled earlier. I walked through the steps to install and configure the HANA service on SAP Cloud Platform Cloud Foundry environment, In this blog series, I will focus on how to get started with building database objects using SAP WebIDE Full-Stack service. One of the main advantages of using SAP WebIDE is that you can now build a full-stack application (Database object, services with business logic and UI components etc). 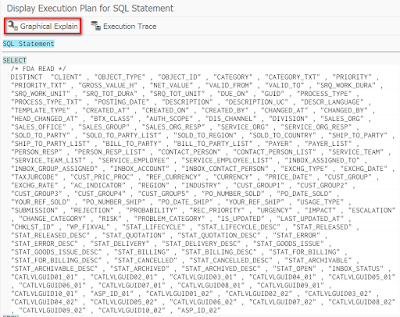 In this blog series, I am going to focus on how to create database objects and expose them as XSOData services. I have come across several requirements where data needs to be stored in SAP HANA service and needs to be exposed for other cloud platform services to consume. Hence, I will start by showing how to create DB artefacts and end by showing how to expose contents of a table using an OData service. If you are lucky to come to TechEd, I have plenty of instances to share for you to configure and deploy yourself. We will be using the Cloud Application Programming model to build a little something on top of them. In part one of this blog series the Document Store was introduced. The most interesting part about this is the possibility to interact with the relational world inside SAP HANA, e.g. joining a collection with a table. Since this is a very abstract feature, the following sections will introduce an example use case including SQL queries for a better and deeper understanding of the SAP HANA JSON Document Store. As we are aware that SAP HANA Cockpit is the new web based tool for SAP HANA Administration, recently I have been involved in BW/BPC HANA implementation migration project and I installed the latest SAP HANA Cockpit 2.0 SPS 06 patch 04 release to monitor and administer the non production and production HANA databases. We know SLT used for real-time replication to HANA but if we face below situations then SLT logging and replay is useful. 1. Table replication shows fine but some data fields not updated correctly(Due to product bug or any other reason) – example cases are flag fields where data changed multiple times in particular time. SAML 2 Single Sign-On (SSO) is usually a must-have for live HANA connections in SAP Analytics Cloud (SAC). In such a setup, the InA service, which is a HANA XS artifact, is configured with a SAML 2 Identity Provider (IdP), typically the same IdP as the one used by SAC. This IdP is often the corporate SAML 2 Identity Provider. Every new technology or platform is developed as a need to address the challenges faced by older technologies, cater to the unmet needs of the consumer or to facilitate a change by making the processes easier and/or economical. Smart Data integration is no exception. In this Part of blog we are going to install SAP S/4HANA Application server. In this part of blog we create the partition of disks /dev/sdc and /dev/sdd, create directories for both HANA Database and HANA IDES Setup files, mounting both directories to relevant disk is also part of this blog, finally we extract and copy the setup file to the HANA IDES setup directory. In this post I want to share the way how to call HANA Procedures via XS JS. This is not a how-to guidepost, I want to share the end functionality that we use in our work. This approach might be very convenient in integration projects when the data extraction rules can be changed during the UAT, so you won’t need to change anything in your integration solutions you just need to apply this requirements in your procedures and change will be committed on the fly. In this part of SAP IDES S/4HANA installation we will install SUSE Linux in the Virtual Machine which we created in the Part 1 of this blog. In this first part of SAP S/4HANA 1610 IDES installation we download all the required files for installation and create a virtual machine in VMware vCenter Server. For installation of SAP IDES S/4HANA, we have to download ISO file for installing SUSE Linux from SUSE Downloads and SAP installation files from SAP Software Downloads. Data Lake analytics have become real. But the challenge is to access the data quickly and provide meaningful insights. There are several techniques to access the data faster. In this blog we see how we can integrate Hana with Hadoop to get insights for larger data sets quickly. If you have both Hana & Hadoop in your eco-system. SAP has provided an option to integrate HANA and Hadoop using Hana Spark controller. Where power of In-Memory processing can be used for real time insights and we can in parallel use Hadoop ability to process huge data sets. My previous blogs have been focused on setting up Python on HANA XSA, connecting applications to HANA Databases, and configuring security and routing settings for applications. In this blog, I am going to delve deeper into accessing a HANA Database within a Python application and creating REST APIs to query data. With IOT gaining traction and SAP’s HANA DB as well as applications becoming warehousing tools, we’re seeing a greater need to integrate IOT data into HANA. One method of achieving this is by allowing sensor data from IOT devices to publish or post data directly into HANA database tables. Once data is in HANA, additional data modelling can be carried out and formatted data exposed for end user consumption to front end tools such as SAP Analytics Cloud or Business Objects. In my previous posts, I have covered details on getting started with Python development on XSA. I am going to continue this series forward and now talk about setting up a central application router for your applications. Again, I am using the same pyapp project in this blog post as i did in the previous ones. It is all about a feature that I found missing in HANA XSODATA — support for OData Function Imports. While this feature can be implemented in a custom way through XSJS, I would like to have this custom implementation compliant with OData V2 specification in order for the consumer application (which is SAPUI5) to be able to leverage the existing ODataModel V2 library. This is my journey for achieving this requirement — by creating a custom function import utility through XSJS. The key element we need to explore in order to see how we can migrate ERP data into HANA is a built-in feature of the SAP system called Smart Data Integration. Smart Data Integration is a feature of HANA that administrators can use to transfer data into the SAP install with relative ease. The details of the procedure may require some basic explanation, but the process itself is as simple as we can find in any sort of system as complex as SAP. In this Blog, I am going to show “How to” create a Flowgraphs in HANA Web IDE with SDI (Smart Data Integration) connection. SAP HANA flowgraph helps you to transform data from a remote source (SDI) into SAP HANA either in batch or real-time mode. In this case, I am using Hadoop database as remote source and loading the data into HANA Database tables. With the release of version 2.0.0 of the SAP S/4HANA Cloud SDK, along with dropping support for Java 7, we were able to incorporate several improvements and add some great new features to the Java libraries of the SDK based on your feedback! Along with the modernization of the technology stack, we took the chance to clean up our code base and remove obsolete and unwanted functionality that – in a few cases – required breaking changes to our API. This post will guide you through the creation and configuration of a Kubernetes cluster on Google Kubernetes Engine (GKE). You will then learn how to connect to SAP HANA, express edition running on the pods. The configurations provided here should also work on other Kubernetes orchestrators such as Azure Kubernetes Service or Amazon EKS. ◈ Modelling options with Open ODS Views. ◈ Consuming external data in SAP BW. ◈ Combining external data with data in SAP BW. Learn how to script R in your preferred editor with SAP HANA data and how to deploy the code directly in SAP HANA. If you are a Data Scientist, there is a good chance that you enjoy working with R. You can bring in your creativity, choose from thousands of R packages and script some very agile data analysis and predictions. The SAP HANA JSON Document Store (also known as DocStore or Document Store) is a new feature which has been introduced with SAP HANA 2.0 SPS 01. The new store combines a relational and document-oriented database to a hybrid innovative technology which is unique for a variety of reasons, namely, its ACID compliant, fully integrated with SAP HANA in terms of access/query and administrative capabilities. Testing database workload is still a large effort for administrators, testers, developers and consultants alike when looking to upgrading from one release to another. Especially when it comes at larger scale scenarios, the amount of work can grow exponentially. This blog is divided into two parts. As we successfully completed OS Setup and HANA DB Install in Part I, we will further see the installation steps to build S/4HANA ABAP Instance. We installed our first SAP S/4HANA systems – IDES S/4HANA 1610 in premise. To setup this environment we purchased 2 Servers of following configuration. Utilize SAP tools to ease development efforts in packaging & deploying SAP UI5 Applications on Mobile/SAP Cloud Platform/Hana Platform. In this blog we are going to discuss how to replicate the data which had been archived on source systems through SARA files. In every project based on agreement we will go for archiving either it will be to keep only last 12 months data or last 24 months based on business agreement. When I help partners set up their HANA Express servers for development use, I want to configure them to impersonate the behavior of Cloud Foundry so that they get used to how the XSA generated URLs work. This approach also tends to promote a more deployment target agnostic behavior and leads to projects that deploy into both HANA XSA on-prem and Cloud Foundry environments without any code differences. ◈ Our customer is an insurance company specialised in house insurance. ◈ Currently, they have all their data in Excel files. ◈ They want to move it into a dedicated system capable of grouping houses in the same area together. It’s been almost 2 years I have started my journey in SAP world. I started with Technical domain for some time and I landed in Functional domain SAP SD (Sales and Distribution). I must say that even after learning and practising it’s still feels like there is lot to learn. My office colleagues helping me a lot to learn things every day. It always exciting whenever you come across new technology. Using a docker image to install SAP HANA express edition can shorten the deployment time and ensure the consistency between environments. The easy way to use it is to build a Kubernetes cluster using Microsoft Azure Container Service and deploy containers in the cloud. A docker container is a package of libraries and system settings required to run an application. It allows to save the time needed to provide a working environment and you can focus on the target database configuration. It’s great especially in environments where you need to provide separated HANA instances for many developers. As organisations continue to convert their SAP ERP systems to S/4HANA, one area that pops up as a roadmap item is how to handle requirements for Planning and Financial Consolidation. In some cases, this provides an opportunity to simplify the landscape and in others prompts a review of what organisations require from a planning solution and what they require from a financial consolidation tool. These discussions are made more confusing for SAP customers, because SAP provide a number of different solutions that cover the topics of planning and consolidation, and at first glance it can be difficult to understand which should be used. The Advantco Dynamics 365 adapter is an adapter for SAP HANA Smart Data Integration (SDI), its purpose is to batch load or to replicate changed data in real time from Dynamics 365 CRM to the SAP HANA tables. In this post, I will discuss the architecture of building a virtual data model (VDM) in S/4 HANA, using CDS Views (Core Data Services). In this blog, I’ll discuss how to create custom rule set in SAP HANA. To implement certain custom use cases, customers have to implement their own rule set for performing Text Search Operations. Figure 1 below shows the structure of Rule Sets stored in XML/Tree Like Formation. I showed how to setup a Kubernetes cluster with three HXE containers running in single pods. As I continue to explore different possibilities with my new favorite toy, I thought I could document some extra steps to connect from an external, local SQL client. One of the housekeeping tasks I generally perform in the instances I use to develop actual applications is to upgrade the Web IDE. Not only because some minor bugs are swept away, but also because there’s always some additional functionality that makes development easier. In this blog, we’ll discuss remaining Text Mining Functions. Functions available to find top ranked related and relevant documents and terms. One of the category of Text Mining function is Document classification or categorization. 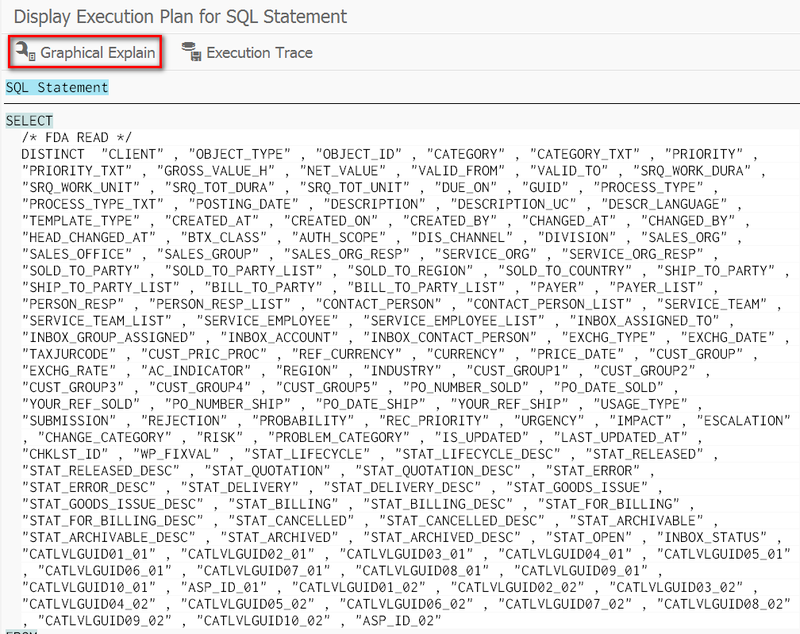 SQL Function in HANA for performing this operation is TM_CATEGORIZE_KNN.